Inverted saloon….or in other words galley forward from the saloon, near the bow cabin rather the companionway. Dufour GL430, 460, 520, Elan GT5, Elan Impression 50 are just some examples of this “philosophy”. The manufactures claim that the saloon is at the widest point of the boat so we get more comfort. Hmm…., not sure if this will work in colder climates like the English channel or around Britain but here in the Mediterranean where the cockpit is THE most commonly used place, either sailing or at anchor, I wouldn’t like to walk through the saloon to get into the galley for my little snack, my beer or to get some ice for my gin and tonic. What’s your opinion about this inverted saloon thing? You are talking about boats which are way outside my league for size, so I have to use my imagination. The nearest I have been to it was a Westerly Cirrus 22' with the galley forward, but I don't think this is quite the same. As far as I can see, it is one of those things that will work well in harbour but less well at sea. In my present conventional set-up, we can communicate between galley and cockpit when sailing but would need an intercom to do this when under way. Another consideration would be that the motion in the galley will be livelier further forwards, and I don't imagine that it would be popular with blue-water sailors. Going forwards to the heads is not a great issue on many boats, but this does seem to reflect a general trend towards boats to attract marina-dwellers. It doesn't matter where you put the galley in a caravan..... does anybody who buys these boats actually go sailing? For me it is one major drawback to the otherwise innovative and attractive Elan GT5. I don’t want to bash through the saloon in wet salty oilskins to make a coffee or soup underway. In our boat we try to avoid wet gear forward of the galley & heads, both beside the companionway. We have had both, And to be honest it Never even crossed my mind, the boats yank hunter legend 40 ft wide arse and an even bigger fridge built 1996, and our current one built in 1984 and 55 ft but the galley is right next to the nav station so it does have benefits. Ha, ha..yes indeed. A dripping wet swimsuit across the boat while getting another beer from the fridge. EThe galley in the bow region was common place before the war especially if paid crew was taken.There are many accounts of the crew making food or tea for the owner and having to go on deck through the scuttle and bring the refreshment aft to the owner in the cockpit.On advantage is air moves fromaft to forward so galley smells don’t invade everywhere.Probably when women started to take an active part in Yachting after the war the galley moved to the companion way at this time double be arrangement started to appear though I don’t know what they could have been used for. Last edited by Wansworth; 29-01-19 at 11:34. 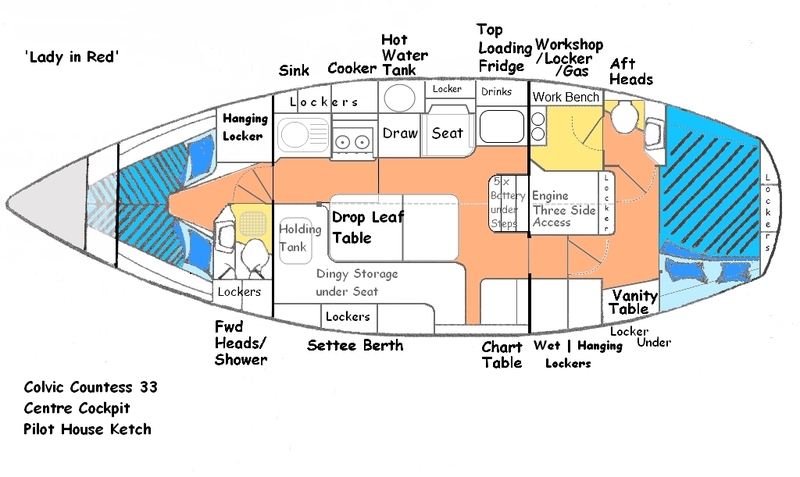 I would think that it's a common layout in deck saloon yachts. That's how mine is arranged. I've never found it a problem.